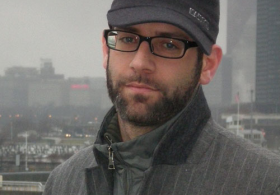 I’ve just finished Chicago hip-hop poet Kevin Coval’s soon-to-be-released book, “Schtick” (Haymarket Books) – a collection of poems that takes aim and fires at the sensitive edge of every nerve ending in the American Jewish psyche. It’s a new take-no-prisoners Jewish classic. Coval has long been known here in Chicago as one of our great local treasures. He’s probably best-known as the founder of “Louder Than a Bomb: The Chicago Youth Poetry Festival,” which was recently the subject of an award-winning documentary of the same name. He’s also the author of numerous poetry collections, serves as Artistic Director of Young Chicago Authors, and offers youth writing workshops throughout Chicago and beyond. While Coval has explored Jewish identity through his writing before, “Schtick” is his most extensive published collection of Jewish-themed poems thus far. It includes previously released poems such as “what i will tell my jewish kids” and “why i stopped going to shul” together with more recently written pieces – en masse, they serve to dissect the post-modern American Jewish experience in as devastating a fashion as you are ever likely to read. Although I’m a longtime Kevin Coval fan, I will confess that there were more than few times in which I flinched at this unabashed, occasionally venomous assault on the hottest of Jewish hot buttons. I will also say without hesitation that these poems deserve to be read and discussed by the widest possible audience. sacred or nothing is. Einstein to unify the chaos. Emma Goldman to arrange the pieces. 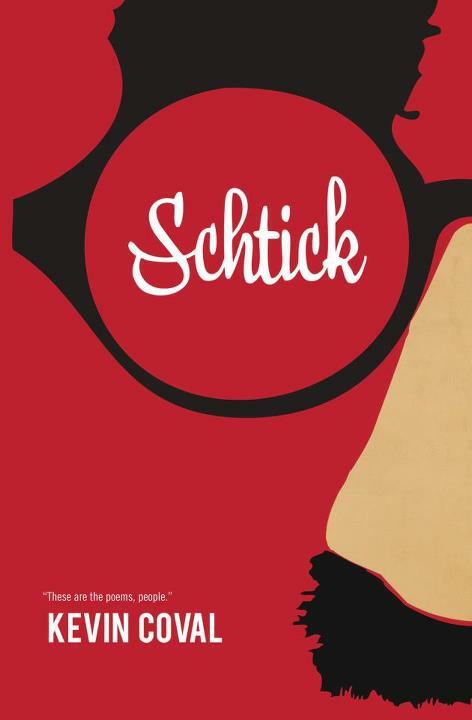 Though there will inevitably be those who find Coval’s writing to be the work of a “self-hating Jew” (he confronts this very issue in a poem entitled, you guessed it, “self-hating jew”), I’d suggest the poems in “Schtick” are quintessentially Jewish. Coval walks proudly in the “self-hating” Jewish steps of Abbie Hoffman, Philip Roth, Howard Zinn and Groucho Marx – a path trod by generations leading all the way back to the young Abraham, the Jewish upstart who one day grabbed a stick and smashed his father’s icons to shards. After reading this poem, I couldn’t help but think that while the lynching of Leo Frank has entered deeply into Jewish mythic consciousness, the name Abraham Raymer remains utterly unknown to most American Jews. And that, of course, is precisely Coval’s point. Coval’s forte has always been poems that seamlessly mix the personal with the political – and in the chapter entitled “the family business,” he explores Jewish identity politics through his own personal family history. While I doubt his family members will kvell at some of his revelations, his remembrances of his 1980s Bar Mitzvah (by turns mortifying, hilarious and heartbreaking), family seders and Thanksgiving dinners resonates with a deep truth and the kind of love that refuses to profane his memories with shallow nostalgia. The chapter entitled “all the pharaoh’s must fall” contains his most directly political pieces, most of them centering on the subject of Israel/Palestine. And for all of his deeply edgy poems, I have no doubt that it is from here that “Schtick” will almost certainly receive the most venomous reception from the Jewish establishment. I am in solidarity with Israeli and American and all people who work and risk their lives and livelihood for justice. I am not restricted to working within the confines of the Jewish-American community. Justice and the resistance to imperialism is a global, human concern for all people down to struggle. For Jews, yes, but not Jews alone. For Palestinians, yes, but not Palestinians alone. It will take us all to push and demand governments and corporate interests to create fair, equitable living conditions. It will take all people to hold history accountable for the atrocities that occur. In “on becoming a man,” Coval recalls that before his Bar Mitzvah service began, his rabbi made him promise that he would not return to be confirmed. By standing so firmly on the third rail of Israel/Palestine, Coval is virtually ensuring that he will remain outside the proclaimed borders of the American Jewish establishment. No matter. In the meantime he continues to carve out an authentically Jewish place in the borderlands – a place where Jews have always made their most productive homes. This entry was posted in Books, Human Rights, Israel, Palestine, Poetry, Religion, Zionism on April 3, 2013 by Rabbi Brant Rosen. I’ve been pointing out for some time now that Israel has been increasingly building settlements in Area C of the West Bank, while evicting Palestinians from their homes there and moving them to far reaching sections of Areas A and B. The intention? To eventually annex Area C to Israel and warehouse the Palestinian population of the West Bank in disconnected, isolated, bantustans. Israeli annexation of the West Bank’s Area C – where all settlements are located – received public support from two high-ranking Likud politicians on Tuesday evening, Public Diplomacy Minister Yuli Edelstein and MK Ze’ev Elkin. But Edelstein and Elkin cautioned that annexation was a process that should happen slowly, not immediately. Together with the Netanyahu government’s stated intention to build in the critical West Bank territory of E-1, it is clearer than ever that the conventional liberal Zionist notion of a two-state solution is a dead anachronism. It’s even worse, actually: as long as we cling to a two-state paradigm, Israel will be given free reign to entrench this injustice in perpetuity. I’ve also come to believe that its high time for those who are interested in a truly just peace between Israelis and Palestinians to come forth with some new creative thinking that might provide alternatives to an obsolete two-state model. 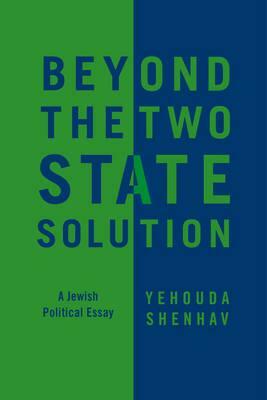 In this regard, I was happy to learn that “Beyond the Two State Solution: A Jewish Political Essay” by the great Israeli academic Yehouda Shenhav, has finally been published in English. Shenhav has long been providing precisely the kind of innovative thinking that I believe is so very lacking in political circles – and I’m delighted his work on this subject will now find a wider audience. Using post-colonial political and critical theory, Shenhav challenges many of the fundamental paradigms and assumptions that have delineated the Israeli political “left” and “right,” while suggesting new and exciting models that might well help us to envision a better future for Palestinians and Jews in the land. In particular, I argue that the so-called “two-state solution” in the form proposed by the Israeli liberal left no only is unrealistic but in essence is based on false assumptions that sustain and reinforce the non-democratic Israeli regime and mask the essence of the conflict. Instead, I offer a different vision for political thought, which is not based on state terror or Jewish supremacy. This entry was posted in Books, Human Rights, Israel, Palestine, Peace, Peace Process, Politics on January 4, 2013 by Rabbi Brant Rosen.